Last year a couple of academic articles regarding VIEs quoted some statistics I’d produced on the topic way back in 2011. Given all that’s happened since then –de-listings due to fraud allegations, going private transactions, and numerous new IPOs – I thought it might just be time to provide an update to the outdated snapshot of VIE usage among US-listed Chinese companies I produced long ago. I also note that Professor Gillis was asked about the topic briefly in his recent senate hearing. I did a bit more of a deep-dive into the nature of the VIE structures we see this time, and might come back with some more details in later posts, but for now I’ll stick largely to providing an update on the items dealt with in my old post. 1. I used a list of Chinese companies listed in the US from the NASDAQ website, this included names of both NASDAQ and NYSE listings, but I noticed it missed some names. I’ve tried to add in the ones that I’m aware of, but I cannot guarantee the list is complete. It doesn’t include any OTCBB names, nor any companies listed in HK (but neither did my earlier sample). 2. Gathering the data involved reading the annual reports, and sometimes amendments and additional filings, of every company on above mentioned list. I’m certain I didn’t miss anything, but I don’t make any guarantees for my abilities to make no mistakes after reviewing several thousand pages of financial filings and management speak. With this in mind let’s dive in. The total number of Chinese companies listed in the US has gone down quite substantially since the last time I did the survey, from 230 to 133 in my list (if anyone has a list with more names please feel free to send it over and I’ll update the information). This is mainly due to de-listings following fraud allegations, companies “going dark”, and to many companies going private. Still, we can see that the companies that remain are more likely to use the VIE structure overall (56% compared to 42% in the original survey). 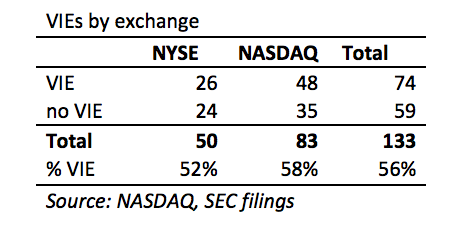 If we look at data on Chinese companies that have done US IPOs over the last 2 years we find that 75% of them have used VIEs. VIEs don’t seem to be getting any less important in the overall investment landscape. The importance of VIEs is even clearer if we look at money raised, with 93% of all funds raised by Chinese businesses listing in the US the last 2 years going to companies using VIEs. I decided to delete the chart regarding why a VIE was used. It was in the original version to highlight that not all VIE usage was necessarily warranted, and while this is still the case today, I expect more people are aware of this. Instead I thought we could have a look at equity pledges. It should be noted that I’ve treated any pledge that was disclosed as being “in process” of registering as not being registered. This is a measure I took after I noted many “in process” equity pledges in earlier years that somehow stayed in this process for several years. 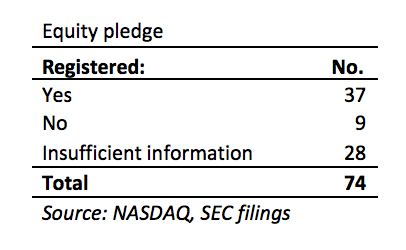 I also included any company that may have had some equity pledges registered, while others weren’t as a “No”. 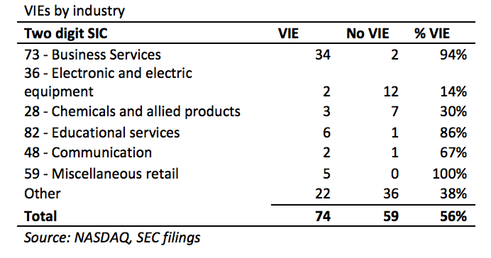 All in all, the VIE structure is still very much around, and if anything, the percentage of listed companies using VIEs looks likely to increase.